Want to start and finish your vacation or business trip completely carefree? With GoOpti's new service you can. 1Even in this case we'll buy you a new airline ticket! Packing before going to the airport is quite stressful, to say the least. Searching for your hidden-in-the-back-of-the-drawer passport, packing your toothbrush, hoping your phone battery will last until you get to the hotel and praying your luggage won't exceed the weight limit are every traveler's worst pre-travel moments. Oh, all that stress! Starting your vacation right is key to a good vacation. We're inviting you to step into our vehicle, relax and let your driver take you to the airport. In the meantime, have a nice chat, a few laughs or a quick shut-eye. To start your travels really carefree, we developed a new service. 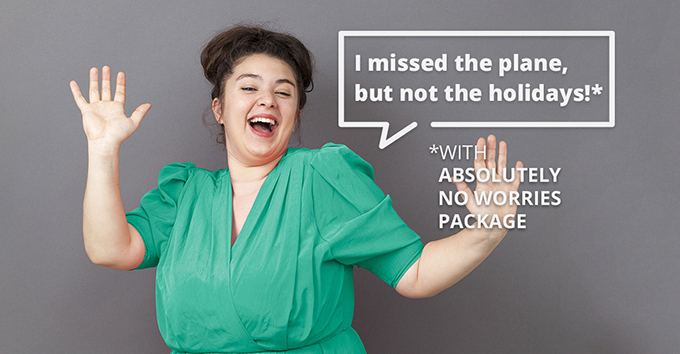 The Absolutely No Worries package is here for you and us – we all need less stress in our lives! In the case of unforeseen situations such as severe weather conditions and delays on the road which lead to you missing your flight, we will provide you with a new flight ticket or organize a substitute ride and, if needed, also book an overnight stay at a nearby hotel. Delays are a thing, whether we like it or not. We've got you covered even if your airline changes the departure or arrival time or location. As soon as you find out about the changes, do let us know. We will organize a new transfer for you. Free of charge. And now for something completely different. Imagine suitcases, full of dirty clothes, and your mind, full of amazing memories. All you want is to get home, have a hot shower or bath and change your clothes. Your vacation did the job – you are now stress-free, full of amazing memories, and telling your friends and family about the most amazing vacation ever is your next big thing. By buying our Absolutely No Worries package, you get a certain transfer back home from the airport even if your flight gets delayed or even transferred to a new airport! Isn't this service totally amazing? Now, let me see your hand! Raise your hand if you want your vacation to start and end carefree. *raises hand* Now, lower your hand and find more information about this package here. And remember – do choose the Absolutely No Worries package the next time you book your vacation – because living life stress-free is the key to a better life.